I was really excited when I received my Making Memories Trimmer/Scorer. Making Memories is a company that has a great array of products. 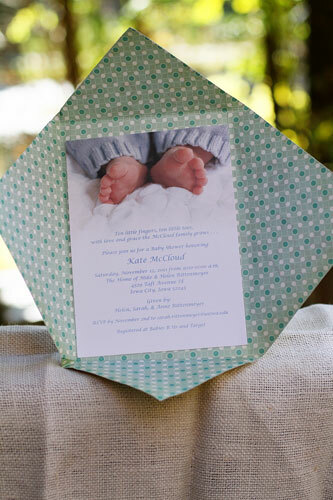 They provide paper and embellishments, kits, storage, albums, as well as digital scrapbooks. But they have long been the creators of some incredible tools that we scrappers/card makers/project creators use on a daily basis. I have seen those adorable rosettes that everyone seems to be creating and with their trimmer/scorer tool I can make my own now too! What I liked: I loved the portability of this little gadget. It folds up and the makes for easy storage. 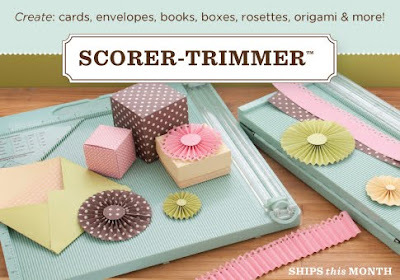 I loved that it has a paper cutter as well as a scoring area. I loved how simple it makes scoring and making those incredible rosettes. It was all self contained (bone folder, instructions included) and I liked that! What I disliked: I had trouble lining up my paper exactly when it came to cutting my paper. It was hard for me to keep my paper straight when snapping the cutting piece into the base. When scoring larger pieces of paper I was off. there was not real guide to help when your pieces are bigger than 8 inches. You have to eyeball it and I wasn't too good at that. It made my larger envelopes uneven. It's made of plastic. Not a real problem but for nearly $40 you will have to take pretty good care of it. Halloween envelope with rosette. I used piece of extra pleated paper to line the bottom of my envelope! Here I just used a page from a map to make a fun envelope to send to someone! This was a large envelope that I made and added a friend's baby shower announcement inside and now it is ready to send to her friends by just adding a stamp to the outside! 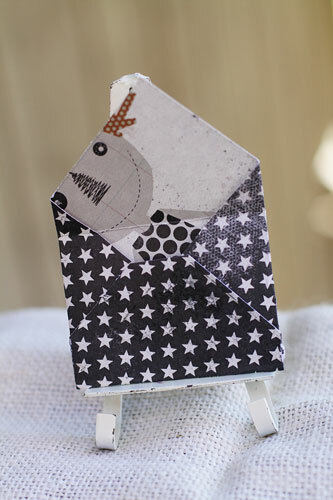 This was a mini envelope pattern available on the trimmer/scorer! What fun! I liked what this tool does but I didn't like that once I got larger than 8 inches I had no guide lines to work with! I wished that the Rosette-it-ring (to help create your rosette once it is cut and scored. A picture of it comes with the instructions) came with the scorer/trimmer. I actually couldn't find it anywhere to purchase either. I love how simple it makes scoring and creating envelopes and rosettes! It's made of plastic so it's not the most durable but seeing as it is not something I would use all the time it would probably be okay. The scoring guidelines are awesome and really make it a breeze to work with! What do you think? Do you have a Making Memories trimmer/scorer? How often do you use it? Leave a comment by midnight EST on Tuesday to be entered to win one!! US Residents only. Be sure to include your email address so we can reach you if you win! No.. I don't have an MM trimmer and a good trimmer :( hope to win this. I've never had a sorer like that--thanks for the chance to win! I am always looking for a new cutter... just never happy. The scorer option sounds even better. No, I don't have a scorer but I REally Really Really do want one! I don't have a MM scorer/trimmer. But this sounds like a good idea if you do a lot crops. Looks like a good option for the scoring I'd like to do to take my creating a step furthur. I have the MS score board and a Fiskars trimmer... but the portability of this one might be worth adding it to Santa's list! I agree with you that Making Memories is a great company and makes quality crafting products. I do not have this trimmer, but find there is no perfect one and prefer to have a few to do different jobs. I would love to have a Making Memories scorer/trimmer. 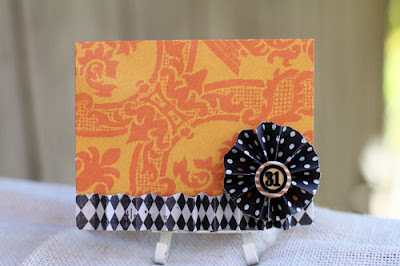 It is one of those special products that I think would be fun to use to create unique cards and embellishments. I havent ever used this brand of trimmer/scorer. It looks easy to use! I haven't seen this but it would be great to have a smaller scorer to take to crops. I would love a scorer! i want to make rosettes! I loved your review. I am always on the lookout for a good trimmer and don't have a scoring tool. I do not have a MM Scorer/Trimmer. I do have a MS scoring board that I use somewhat regularly. 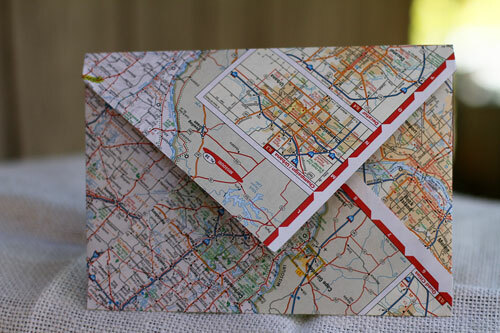 I like to get the nice clean straight lines when Im doing cards, and Im doing alot of them right now for the holidays. The trimmer I use is about 10 years old, and cannt get replacement parts anymore, so the added trimmer feature would be a great extra. Thanks for a chance to win. way too cool! I am def looking to get a scorer! Loving all the rosettes and would love to be able to make them as well. Love your cards. Thanks for sharing. I don't have one, but I'd love to. I like that it scores and cuts! And the rosette-it-ring sounds handy! Thanks for the chance! This looks like a cool tool. Great combination! Wow, just love your projects! This looks super cool! I have the martha stewart scoring board and love that, but this is more compact AND has a trimmer on it. Not only great all the time, but IDEAL to bring to crops!!! Love it! Thanks for the chance to win one! I bought this at hobby lobby recently and was very disappointed. It ruined anything I tried to score or trim because it is not a true 45° angle. Everything was skewed by abt 1/16th of an inch on one end. (I checked it with a triangle). Such a shame because it's a very neat idea to have it all in one like that. I returned it.